How does your mattress compare to Tempur-Pedic® or Memory Foam mattresses? Tempur-Pedic® mattresses are made with petroleum-base polyurethane and other chemicals known to emit Volatile Organic Compounds (VOCs). Tempur-Pedic® has built a well-known brand around their line of memory foam mattresses. 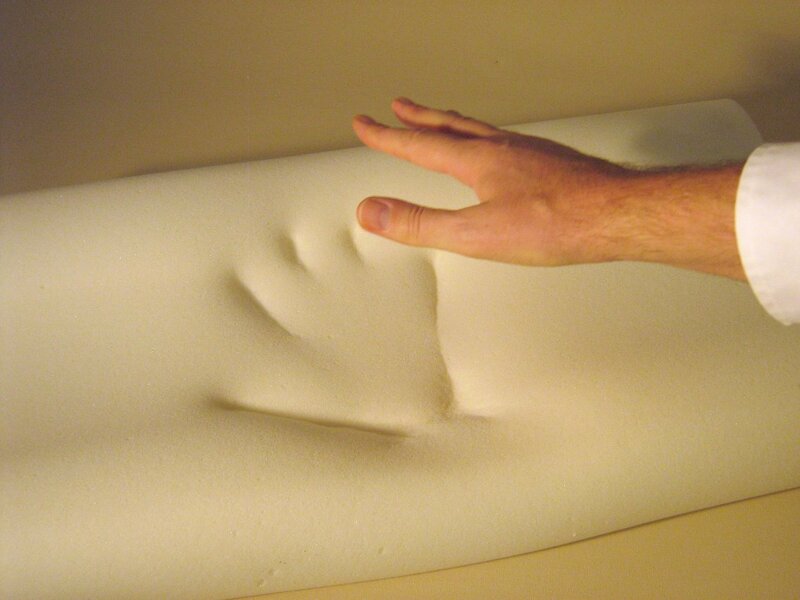 Memory foam is also known as "viscoelastic" polyurethane foam or low-resilience, petroleum-based polyurethane foam developed in 1966 by NASA to improve the safety of aircraft cushions. Chemicals are added to the polyurethane foam to make the foam "slow" to respond and recover. Memory foam mattresses tend to sleep "hot" because you "sink into" a memory foam mattress, which does not allow air to circulate well. But more importantly than its heat retention properties, memory foam mattresses are known to be hazardous to your health. Avocado Green Mattresses do not use memory foam. Our mattresses are handmade with natural and organic materials, such as 100% GOLS organic certified latex rubber, and also feature an advanced innerspring unit for support and durability. To objectively explain, below is content directly from Wikipedia. You can read the full article here. Emissions from memory foam mattresses may directly cause more respiratory irritation than other mattresses. A 2002 American-Norwegian study claims children's "foam" mattresses are 3.3 to 8.1 times more likely to host dust mite feces than spring mattresses, yet the study did not mention if the foam tested was of the standard or shape memory type and simply referred to covered or non-covered foam mattresses, which could lead to believe the foam in question could be the standard less expensive non-memory type. Memory foam, like other polyurethane products, can be combustible. Laws in several jurisdictions have been enacted to require that all bedding, including memory foam items, be resistant to ignition from an open flame such as a candle or cigarette lighter. US bedding laws that went into effect in 2010 change the Cal-117 Bulletin for FR testing. There is concern that high levels of the fire retardant PBDE, commonly used in memory foam, could cause health problems for users. PBDEs are no longer used in most bedding foams, especially in the European Union. Manufacturers caution about leaving babies and small children unattended on memory foam mattresses, as they may find it difficult to turn over, and may suffocate. The United States Environmental Protection Agency published two documents proposing National Emissions Standards for Hazardous Air Pollutants (HAP) concerning hazardous emissions produced during the making of flexible polyurethane foam products. The HAP emissions associated with polyurethane foam production include methylene chloride, toluene diisocyanate, methyl chloroform, methylene diphenyl diisocyanate, propylene oxide, diethanolamine, methyl ethyl ketone, methanol, and toluenehowever not all chemical emissions associated with the production of these material have been classified. Methylene chloride makes up over 98 percent of the total HAP emissions from this industry. Short-term exposure to high concentrations of methylene chloride also irritates the nose and throat. The effects of chronic (long-term) exposure to methylene chloride in humans involve the central nervous system, and include headaches, dizziness, nausea, and memory loss. Animal studies indicate that inhalation of methylene chloride affects the liver, kidney, and cardiovascular system. Developmental or reproductive effects of methylene chloride have not been reported in humans, but limited animal studies have reported lowered fetal body weights in rats exposed. More recently Tempur-pedic (now owned by Tempur-Sealy) has been sued with a court case underway for not disclosing the use of several of the aforementioned harmful fillers in their memory foam including formaldehyde. The plaintiff demanded a list of the ingredients used inside Tempur's mattresses and pillows since 2003 and after several attempts to deny the request by the defendant the judge deemed that the list would not violate the trade secret protection clause in that the plantiff's entire case relies on false advertisement. The judge stated that, "having reviewed the parties' arguments, the Court finds that discovery of the TEMPUR® formula is appropriate. Plaintiffs have shown the relevance of the information because their claims revolve around Defendants' advertising campaign, which consisted of "numerous affirmative misrepresentations" on Defendants' marketing materials, such as Defendants' products were "hypoallergenic," "resistant to allergens," and "free of harmful VOCs (volatile organic compounds) such as formaldehyde and CFC (chlorofluorocarbon)—harsh chemicals that can trigger allergies and asthma." Jt. Ltr. at 3. They have made a prima facie showing of the need for the formula, alleging it would show whether Defendants knowingly made the affirmative misrepresentations about their products and failed to disclose material information of which they had actual knowledge. Id. Finally, a stipulated protective order is already in place in this action, and the parties agree that the formula is entitled to protection."